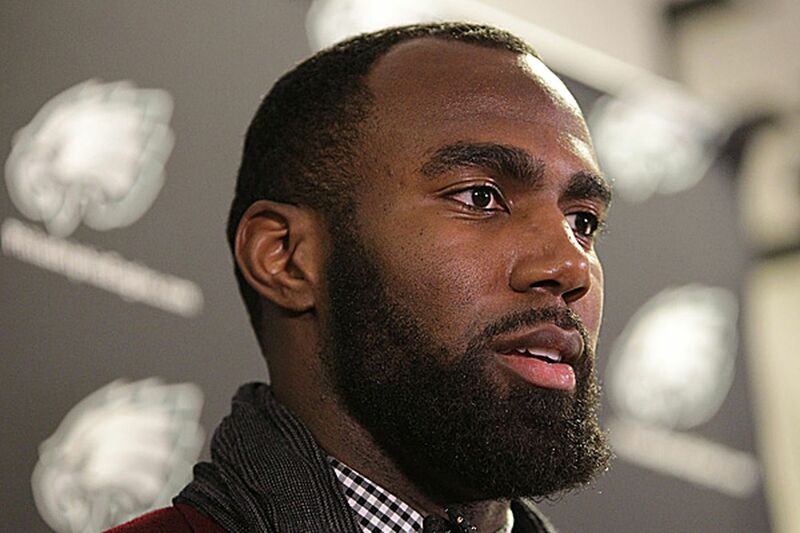 PISCATAWAY, N.J. - When the Eagles started defensive meetings in April, Earl Wolff sat behind new Eagles safety Malcolm Jenkins. Wolff glanced over Jenkins' shoulder at Jenkins' notebook and was astounded at the level of detail. So Wolff started sitting next to Jenkins, and he has shadowed the Eagles' top defensive addition since. It's the same notebook former Ohio State coach Jim Tressel remembers Jenkins carrying around when Jenkins was an all-American for the Buckeyes. The Eagles' dogged pursuit of Jenkins had much to do with the way he plays safety, but it was also because of the intangibles they wanted from the player they expect to lead their secondary. Those intangibles were fostered in the home of Lee and Gwendolyn Jenkins on Third Street off Rock Avenue in Piscataway. That's where Jenkins' friends congregated, where the van that drove the children home from football practice parked, where Jenkins learned leadership from two parents who emphasized looking after others, and where he put those lessons into action as the oldest of three boys. "I've always been the guy out front," Jenkins said. "It kind of comes natural to me." The Eagles signed Jenkins to a three-year, $16.5 million deal when free agency opened in March. It represented the biggest commitment the team made to a safety since Brian Dawkins departed in 2009. The Eagles targeted Jenkins over two acclaimed free-agent safeties whom Eagles coach Chip Kelly was familiar with from his days at Oregon - Jairus Byrd and T.J. Ward. Other dynamics were involved in the team's evaluation, from cost to playing style to health. But the Eagles never wavered in their admiration of Jenkins. They liked the versatility that allows him to play in the defensive box and in deep coverage. They also wanted someone to quarterback the defensive backfield - Kelly compared Jenkins' role in the secondary to DeMeco Ryans' in the front seven. And Jenkins has a reputation of delivering those intangibles. The son of Lee and Gwendolyn Jenkins has been a captain at every level, from a Piscataway High School team with three NFL first-round picks to an Ohio State squad loaded with future pros to the New Orleans Saints defense. So Jenkins understands he was brought to Philadelphia for more than the way he plays safety. "If you were to ask me at 9, 14, 19, did I think I was going to be in the NFL, the answer would probably be no," Jenkins said. "But if you were to ask [my parents], would somebody hire me specifically for my leadership skills and the type person I've become, I think they'd say yes." "At this level, obviously they're all good players," Lee said. "The difference at this level is not physical. It's mental." When Jenkins was a teenager, he took a summer vacation to Columbus, Ohio, where his aunt lived, and his parents looked for a local football camp. They found one at Ohio State, not realizing the magnitude of the camp. Jenkins was a one-star recruit at that point. The only school that had aggressively pursued him was Rutgers, just minutes from his home. Not an invited prospect, he paid to attend the Ohio State camp. During one-on-one drills, Jenkins continued jumping to the front of the line. He covered some of the most decorated receivers in the Midwest, switching places with defensive back prospects ahead of him. "He was there on a mission," said Tressel, now the president of Youngstown State. By the end of the camp, Jenkins had a scholarship offer. His Piscataway coaches were not surprised that Jenkins jumped to the front. That's always been Jenkins' personality. It was how he was raised, and how he remains. He did the same thing when he was a high school sophomore. "We encouraged that," said Larry Lester, Jenkins' assistant football coach and track coach at Piscataway. "He took the liberty of doing it consistently." Naturally curious, Jenkins learned the responsibilities of the other players on the team. Four players at Piscataway during Jenkins' time at the school would go on to the NFL, and his coaches said the other players would follow him. "He totally bought in to the fact that he could influence and impact what other people do," said Dan Higgins, his high school coach. "He was a natural leader because of that. It wasn't because we said Malcolm's the captain. It was because Malcolm was the most highly respected guy on the team." Higgins, whose father, Tom, played for the Eagles in the 1950s, listens to Philadelphia sports-talk radio. He hears what Eagles fans want in safeties. He wants them to know Jenkins has those qualities. "To know that he is now sought-after for the intangibles that made him so successful when he was younger is a great compliment," Higgins said. "There's great athletes everywhere. . . . It's the other stuff, that's the rarity." In an October game against New England, Jenkins was credited with 11/2 sacks of Patriots quarterback Tom Brady. But the sack he talks about seven months later is one that does not appear on the stat sheet. On a first down in the second quarter, Brady identified a Saints blitz. Jenkins barked instructions of his own. The changes freed the middle linebacker, according to Jenkins, who rushed unimpeded for a sack. "That doesn't get quantified," Jenkins said, "but if I don't change that call, we don't get that play." Jenkins will be compared to Byrd, and any Eagles safety must deal with the Dawkins ghosts. He is different from both. Jenkins maintained that his best seasons in New Orleans came when he was given freedom to roam around, playing both in the box and deep in coverage. The Eagles are expected to grant him that freedom. His effect also will be seen through those intangibles and how they improve a defense that allowed the most passing yards in the NFL. He said if he can set up the defensive backfield to simply "eliminate the dumb stuff," that will be a major step. Jenkins said cornerbacks can benefit the most from what he does. If he can ensure they are in the proper position, then they can go off their natural instincts. "I bring that cohesiveness in," Jenkins said. "You need that one guy who everyone in the secondary can turn to. Because multiple times in a game, there's going to be miscommunication, and you're going to need one voice to clear that up. . . . I've been that guy for a long time." It's a role that Jenkins has held from the time Lee kept him from quitting his youth team. Jenkins has been at the front of the line ever since, a leader on each team and a winner at each stop. The Eagles signed him to be the same in Philadelphia. "In my mind, I don't feel like I need to come in and make a drastic culture change," Jenkins said. "I'm going into a good situation where I'm valued, they want me there, and all I have to do is be me."